In Valchiusella there is Alice (a word that is slippery, with an accent on "A"), a land of wonder. Among the wonders of Alice there are the peat bogs and the two homonymous lakes, large and small. In Valchiusella there is also Alice (flat word, with emphasis on "i"). Alice lives in Rueglio, another country of wonder. Alice in Rueglio knows everyone, and knows everything. The story, the traditions, the writings of Pietro Corzetto Vignot *, the "poet at the bottom of the sea". He tells me about the Ka 'D Mezanis and the Cogna lawn, which as a beauty does nothing to envy the celebrated Cogne lawn (Sant'Orso's meadow). In the background instead of the Valnontey there is the Beautiful Sleeping, the ridge that connects the Quinzeina and Verzel peaks, which in some dawns and sunsets have nothing to envy at the peaks of Gran Paradiso. The Beautiful Sleeping (La Bella Dormiente) accompanies a good travel stretch. In addition, the riding in Valchiusella takes place entirely in a mountain environment. A particular setting, however, makes this valley unique in the Piedmont landscape thanks to peculiar morphological characteristics. Meanwhile the Valchiusella is not a single valley but two, and that was considered times ago. The part closer to the plain is wide, open and welcoming, with more hilly than alpine appearance, it was known as Chy Valley. 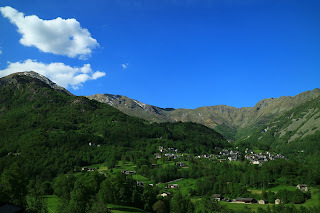 The upper part, called Brosso Valley or Valchiusa, assumes a fully alpine characteristic. In particular, from Traversella up, the name "Valchiusa" is accredited by a harsh environment, where the slopes slop down the valley without restraint. Alpes canavesane doc, in short, playground for demanding hikers. Suitable for demanding pedestrians is the suggested itinerary, which favors the lower part, up to Traversella, limiting itself to lapping the "alpine" area. An itinerary largely by a ring, which from the provincial valley road moves on the quieter provincial side to reach the most secluded corners. Departure suggested by the locality Ponte Preti, hamlet of Strambinello outside the valley, however, entrees perfect: the location on the shore of Chiusella and the beautiful bridge are an ideal premise for pedaling. After a slight uphill in the woods you reach Baldissero, a village at the foot of the Monti Pelati (Peeled Mountains), where you enter the valley, greeted by the Gurzia Strait. After Vidracco, however, the valley opens into the Vistrorio basin, thus presenting its characteristics. In Gauna (Alice's village) you leave the valley to climb to Pecco, so you continue to balcony on Alice's peatland towards the homonymous lakes. Once arrived in Alice on a secondary road, you return back to the main valley road. A mile or so, then leave it again to Brosso, where, with a relaxing plan, you go to Vico. Back on the main valley road you pass Drusacco and then you arrive at Traversella, the end of the journey. For the way back you change side. Crossing the Chiusella you go to Inverso, and then with a steep descent you fall on the wide valley floor. A pastoral and bucolic environment accompanies Trausella, where it leaves the main street to continue on the side towards Envers towards Rueglio. With a shady climb you gain the large terrace that houses the inhabited area at the foot of the Bossola top. He then goes down to cross the Chiusella to close the ring and continue on the way to Vistrorio. Where you change, for the epilogue you go on another way. With a last, quiet lifts on the left bank of the Gurzia reservoir, the Morenic cord surrounds the valley at noon. Beyond the plain: in lush bends between the rows of vineyards it falls to Strambinello and then to the pedemontana. To cross cautiously: below there is Ponte Preti. Walking on the bridge appreciate Chiusella's work. A glimpse at the top of the village, Strambinello, in a typically "canavesana" position on the sunny side of the morainic cord where you will pass on the way back. A slight uphill in the woods and clearings. One kilometer of straight road leads to the crossroads with Pedemontana national road 565, high traffic road, you need to be really carefull, you enter Pramonico, a hamlet of Baldissero. Above the village continue on the SP 222 towards Castellamonte. A hundred meters or so: at the first street (via Molino) turn right to the centre, reaching the parking area overlooking the town hall. You enter in the valley to get to the base of the altitude of the "Monti Pelati" with the homonimous natural reserve (see below). The road is the provincial road 61, after a while the short digression for the historic core of the country offers an opportunity of variation on the cobbled streets of the village, thus passing at the base of the bell tower, curiously dissociated from the church. The Valley of Chy, the lower part of the Valchiusella, despite being described in the introduction as wide and welcoming, welcomes the cyclists with a narrow strip. 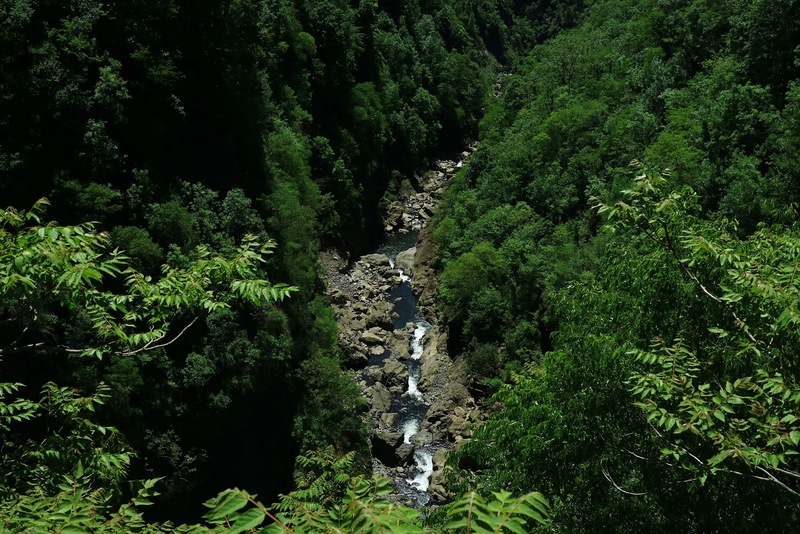 From the village, after a debut at the foot of the "Monti Pelati", the road runs for a long time in pedalable, but steadily rising on the right side of a ravine: the Gurzia Orrid, which captures the Chiusella stream before releasing it on the plain. Surprise is, however, balanced by the place, picturesque and interesting geologically. There is a stopping place to watch the stream from above, stopping to be done while paying attention to the road, in this narrow and winding spot. The gorge is barred by the dam that forms the hydroelectric (Gurzia or Vidracco Lake) reservoir, from which the Chiusella rushes in the gorge with a significant jump. After the invasion the valley opens and in short it reaches the second village, Vidracco. The "acco" ending (widespread in the valley, derived from the Celtic "water") features the main distinctive element: water, a driving force for the economy of that time, as the eco-museum bulletin informs. The parking area at the town hall also marks the end of the first uphill section, just after the road gives a respite: an opportunity to rest your gaze, laying it on the soft ridges of the left orographic slope. It looks like more Tuscany than Alps down the valley, and Tuscany village seems Vistrorio, which gives itself to the sight drowned in the green.In a very different aspect is the sloping side of Monte Gregorio, the last conspicuous elevation on the left side of the valley (the mountain is well visible between Ivrea and Quincinetto, bordering the Valle d'Aosta). Monte Gregorio confirms that we are talking about the Alps: past the sign announcing the village, leave the deviation for Issiglio, at the entrance of the wild Savenca valley, and relax to cross the bridge on Chiusella, thus starting the pedal On the left orographic side. You resume climbing uphill. With a momentary change of direction you go towards Vistrorio, reaching the intersection with the Sp 64 coming from Strambinello, where the journey will continue. However, it is advisable to postpone the entry for a short digression in the village downtown, thus pedaling to a slight ascent. 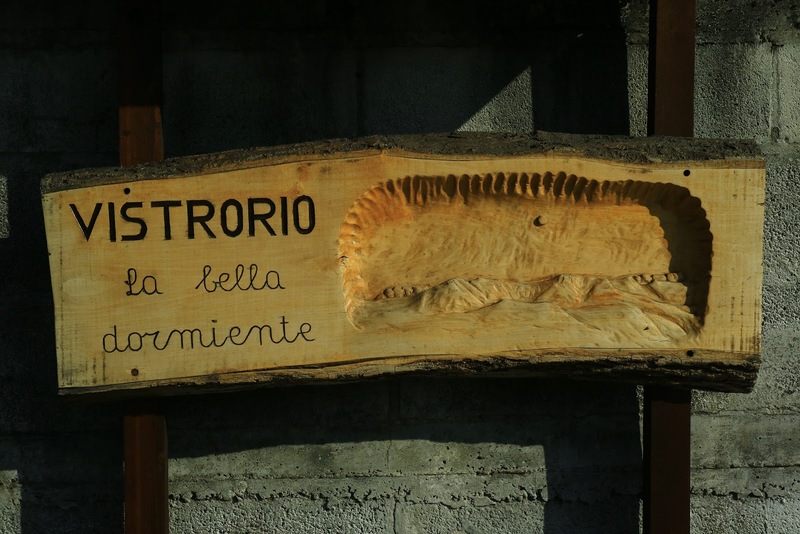 At the exit from the village a wooden panel carries the engraving of Bella Dormiente, the ridge between Quinzeina and Verzel, who will accompany the journey for a while, offering a lot of beautiful views. Left Vistrorio, the road continues in a reasonably sloping direction, cutting off the shaded north side of the slope. Once in Gauna, a village of Alice, leaves the valley's provincial road to the right on the quieter Sp 65 following the "Pecco-Lugnacco" (still Celtic endings). 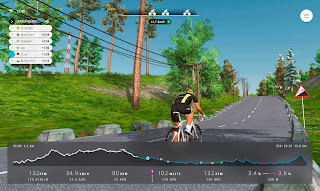 A couple of narrow curves point to a steep, steeply straight sloping straight edge that rises to the edge of Pecco, where you continue to the left for Ivrea and Alice (the downtown requires a short climb). The ascent ceases and, after a few meters, an opening in the vegetation allows an enlightenment overlooking the Chy valley, with an exceptional view on the val Savenca and Bella Dormiente. 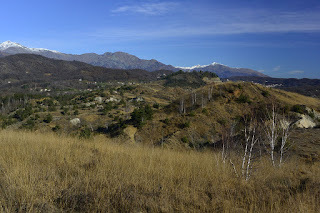 To look at it, however, is mainly Rueglio with its roofs of loss, in remarkable chromatic contrast with the green around (on the left, a trail - MTB trail down to 15 'below the peat bog). Let's go now looking for nature. The viewpoint is the premise of a relaxing and shaded descent on the wooded slopes of the morainic relief, high on the Alice basin basin (see final card) and the small valley of the Secchie torrent. The descent ends with a pair of narrow hairpin bends leading to Sp 68 Alice - Lessolo (via Ivrea). Turn right and immediately left to Priere region you come from the rest area - information point of the Alice lakes area (Small and Large) starting point of the pedestrian paths that surround them (picturesque views of Lake Grande are Also possible from the bicycle saddle, continuing for a while on the provincial road towards Lessolo). The provincial road 68 leads directly to Alice in about a kilometer, but you can opt for a slightly more demanding solution, however it can make a satisfying periplo of the peat. From the info point it cuts up slightly between the two lakes to the point where the road carries a right bend to the right, lapping a house. At this point, a carriage runs in the opposite direction (MTB trails, but it can also be done with a non-specific bike), which continues to climb slightly to the foot of the slope, after about 200 meters in the asphalt road connecting the town to the Piani region . To the left, above the peat bog, you reach the upper part of Alice Superiore (Via Piani), dominated by the parish church dedicated to San Martino. Going down to the village, continue on the main road, beyond the town hall square, to resume the Sp 64 in the valley. The road returns to rise, the valley narrows ... and forces the Chiusella into a rocky cliff: la gola di Garavot (Garavot's gorges). After passing the right dive to the Meugliano lakes, you reach after a hundred meters at the starting point of the trail that, within a few minutes of descent, allows you to appreciate one of the most spectacular spots of the entire course of the creek. Returning to the detour, leave for the second time the main road to go to the quieter Sp 66. The destination is Brosso, secluded village on the north-eastern end of the valley, at the foot of the Gregory and Cavallaria Mountains, on the edge of the deep Dora Baltea. As soon as you turn, you begin to ring a series of sloping bends in a beautiful chestnut tree. At the end of the bends, the unexpected appearance of conifers (pines silvestri and larch) announces the area of the Meugliano lakes, reachable by a half-kilometer deviation (the lakes of Meugliano are probably the most popular touristic site of the valley). The provincial road 66 continues to climb without ripples in a gallery of fronds (conifers, chestnuts, ash) that attenuates any summer heat and allows you to appreciate the perspective that, after a kilometer, opens onto the village. The paragliders taken off from the top of Mount Cavallaria accompany with their turns the following descent: their destination is a lawn in Baio Dora, the destination (intermediate) of cyclists is instead a panoramic square where a sign announces: Brosso, 797 meters. With a further climb you reach the village, and with a further supplement you can reach the cemetery St. Michael's Church that draws your eyes up. With friendly weather, the glimpse is worth the effort: an authentic horizon, from Monte Marzo to Serra d'Ivrea, with the "red tower city" at the bottom, on the shore of the cerulean Dora. 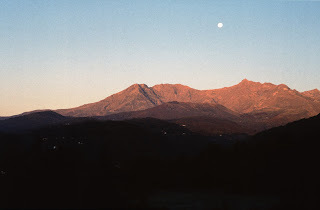 (The church of San Michele is located at the extreme east border of Valchiusella, on the eyelid of the deep furrow of Dora Baltea: you can see it by traveling on the A5 between Ivrea and Quincinetto, anxious to enter the Vallée). In the heart of the village, you can go to the opposite side, at the little church of San Rocco, which houses an exhibition of minerals (the church is the starting point for the mineralogical path of the Brossasca Park). From Brosso you go to Vico. The journey changes direction from north to west, and in a couple of kilometers of gratifying planed at the foot of Mount Gregory you reach the most populous downtown of the valley. A characteristic vultun is the premise at the center of the village, which crosses to proceed on the opposite side to Traversella. When you leave the village, you can appreciate a particular landscape border: in front of the cemetery of Drusacco (fhamlet of Vico), the Truc del Castel, a beautifull little hill of lawn, which at the culmination the eye is attracted by a crown of trees. Some Ashes and Cherry trees in a singular position against the sky, while, on the edge of the street, a solitary walnut is thought to have been placed there to favor photographic compositions. The scene remembers once again the hilly attitude hill of the low Valchiusella, but just look to the west to realize that it part of the Alps, the Alps Graie canavesane, far from the hills ... After 100 meters you go back to the valley bottom (Sp 64) short distance from Drusacco, another village with ending "acco" which welcomes travelers with the beautiful centralized street and the fountain whose water is called "queen of the springs". At the opposite end of the village, observers will not miss the plaque on a home: Monte Marzo, a non-random landmark, tribute to the Monarch of the valley. The "Marzo" ("March") is there defiled, displaying, as a true lord, his unmistakable pyramidal profile. Traversella is now the goal. Once left Drusacco the road goes softly following the descent. The journey improves pedalling effortlessly, leaving your eyes free to rest on the opposite side, where you will pass on your return. The gentle slope of Bossola top, with an harmonious alternation of woods and dotted lines of densely populated dwellings, looks like this. At the foot of Mount Lion it is opposite, with its bell tower standing "in the reverse of the valley". Above the ridge, the slender Pyramid of Verzel tries to steal the scene, but it is a vain attempt because very soon Monte Marzo restores the hierarchies. In short, the sign indicating "800 meters" is the premise at the entrance to the wide basin of Traversella. Crossed by the river Bersella, with a hairpin, you reach the heart of the village, lithic heart, seen the past, intense mining activity, witnessed by the Museum of Mines. Situated on the left side of Bersella, the museum allows, among other things, to observe rare minerals, mostly from Monte Gregorio. ... and not in a metaphorical sense. A return journey of discrete effort to make direct acquaintance with the most alpine face of the valley: the Valchiusa of once. Almost to validate the place name the valley closes immediately and, on a narrower road, continues to the west. With Mount Marzo fixed on the horizon and the Chiusella singing in the gorge, it alternates mild slopes with short climbing ripples, reaching 4 kilometers crossing the bridge over the Rio Tarva, a few meters from the beginning of the trail to Succinto. Situated in a panoramic position on the slope of the valley, Succinto is an extraordinary village, perfectly preserved: highly recommended visit. Another sprint leads to the bridge over the Chiusella that crosses to continue on the opposite side. The road becomes steep, but ultimately grants a truce, and it is good because "Fondo" and its arch bridge on Chiusella are deserving of quiet appreciation. Then you come back. Monte Marzo behind and hand on the brakes the road goes down to Traversella. Then it changes. Traversella is the terminus, for the return it changes its course. And it changes the way of travel: the way back begins with a steep descent to the bridge on Chiusella. From Piazza Cavour take the road to the high valley, a few meters only then turn left onto the ring road and, on the brakes, descend to the point where the slope is dimmed: it is here that you turn right Via secondary to Inverso. Again with hands on the brakes, the route falls unreservedly to the bridge that joins the two sides of the valley. The crystalline water of the creek and Mount Marzo on the horizon, more soaring than ever, are worthy of a contemplation stop. Follow the short climb on the opposite side, compensated by the glimpse of Traversella in a solitary position at the foot of Monte Gregorio. Inverse, Vico enclave to the inverse of the valley. The square of the church is the premise of a long descent: a first steep section leads to the bottom valley, where the slope attenuates considerably and can be abandoned to the force of gravity. Back to Mount Marzo, it rests on the edge of beautiful stretches of lawn. A joy for the eyes, true cycling relaxation. 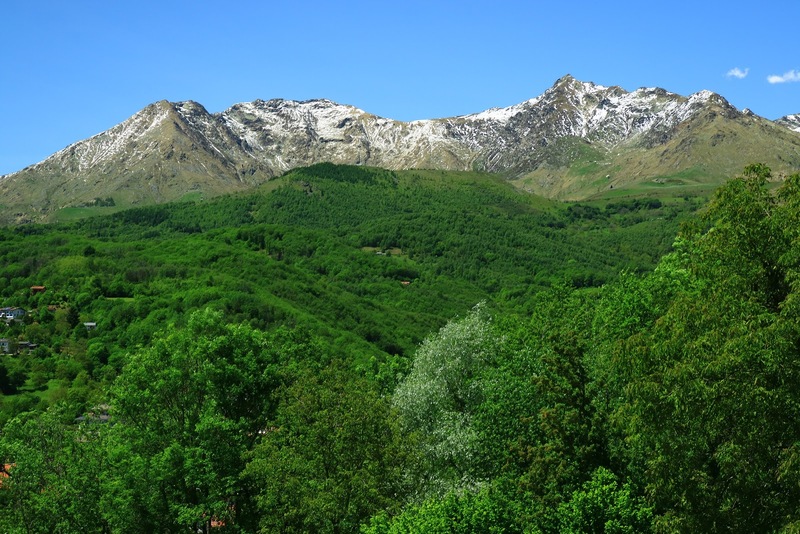 The destination is Trausella, a small village at the foot of the northern slope of Bossola top. In the village you leave left the road that cuts in the valley to cross the Chiusella and continues on the plain in the direction of Rueglio, along the same street. On the opposite side stands Drusacco, a hamlet known as Vico, while behind Mount Marzo is about to leave the horizon. One last gift to the Valchiusa Lord is certainly good wish for the continuation of the journey: shortly, a climb is waiting for the bikers. After Trausella, the road moves away from the foot of the slope to cut into the plain, at the lower end it moves back to the side of the mountain. The environment changes - from lawn to forest - and it changes the effort: from the mild descent to the announced climb. Almost to compensate the effort awaiting the bikers, Trausella's plain performs with a corner worthy of "intimate" observation. At the edge of the forest, where the climb begins, the suggestion is to get off the saddle and gratify the look with the scenery, worthy of either a Segantini or a Delleani. "Bucolic" is the appropriate adjective, "invigorating" is the adjective suitable for the afternoon shadow that accompanies the ascent. The beginnings are sweet, then the slope becomes more sustained, but the stretch is short: once the ridge descending from Bossola the climb becomes a relaxing slight slope. The journey changes direction ... and returns to Chy Valley. Part 4, from Trausella to Rueglio, to Strambinello, to Ponte Preti. The return to Chy valley is marked by the peaks of Quinzeina and Verzel. Near a curve, where the descent on the bottom of the valley begins, it is good to leave the main road to head right onto the first entrance to Rueglio. Raised on a large natural terrace between the main valley and the lateral valley of the Savenca, at the foot of the sun-drenched slope of the Bossola peak, "Rüvèi" offers various reasons of interest, architectural and landscaping. In the heart of the village is the Ka 'D Mezanis, a historic home, one of the best preserved in the area. A true monument: dating back to the 1500's (the oldest part), the building conserves exemplary architecture with arcades typical of Canavese (after conservative restoration, Ka'd Mezanis will become a representative building, museum building With spaces for exhibitions). Going beyond the village in via del Mulino, you reach the little church and the Cogna Plan (Piano della Cogna), which is exquisite that "because nothing of beauty is envied by the celebrated lawn of Cogne ...". Only a few decades ago the plain was a multicolored expanse of cultivations, a source of zero-kilometer zero-living subsistence. Back in the village, in the central square, the town hall square, begins the descent into the valley. Slightly steep descent: a pair of bends precede the long bridge on Chiusella. It is crossed by momentum, thus capturing the thrust to overcome the short climb that goes back to the provincial road downstream of Alice. Late afternoon light hides details but exalts the profiles. Like the profile of Bella Dormiente that accompanies the relaxing fall for Gauna and Vistrorio. A road known not as a continuation. At the first intersection, leave the road to the right on Sp 61 and go left, continuing on Sp 64 towards Ivrea, but especially towards Strambinello. The road rises once again, the last mild climb to the morainic ridge facing south of the valley. Lastly and repayed by the prolonged glimpse of the tranquil water of Lake Gurzia, illuminated in the afternoon light shining. The same light that relaxes on the valley: earning the morainic crest is good to stop for a last look. Above the ridge it changes horizon: from mountains to hills. But this is always Canavese. Canavesani's landscape's, vineyard rows and the village of Strambinello. They accompany you in a lively sequence of bends at the intersection with the pernicious state "pedemontana". A short interval of caution before arriving: crossed (very carefully) the carriageway enters the cobbled road that, with a last, short downhill, leads to Ponte Preti. The most beautiful bridge on the Chiusella creek. ⃰Pietro Corzetto Vignot, Peder Kurzat Vignot, illustrious citizen of Rueglio, lived between 1850 and 1921. Poet and scientist invented, among other things, the meticulous sphere of the submarines. A different trip also for the types of roads. 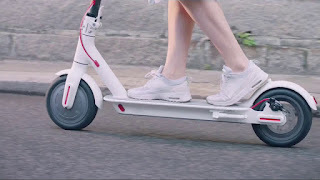 In fact, you pedal the streets in the provinces that serve the valley centers, characterized by relatively intense traffic, especially during peak times and on public holidays. The suggested solution, though quite demanding for the overall altitude, still ensures a quiet peace of mind. The traffic, especially on the valley bottom, is not discouraged by the many cyclists who have chosen the Valchiusella to play ground, attracted by the landscape and slopes, accessible to all, provided they have the right means and a bit of habit. In virtue of the aforementioned peculiarities, Valchiusella would deserve even wider access, even to the less sporty cyclists. This is why it is trusted that local administrators will take or seek appropriate measures to improve pedestrian visitor safety: in the interest of the visitors themselves and the economy of the valley. Go to "Fondo" (at the end of the valley): a variant suitable for most grimpeur. From Traversella you get to the end of the main road. Five kilometers and 200 meters of slope with a crescent slope, awarded by the beautiful bow bridge on Chiusella. The less trained may choose to avoid lateral digression, remaining on the valley bottom. It abbreviates the path and limits the altitude difference, at the expense of variety and tranquility. Another possible abbreviation, limit the trip to the valley, starting and returning to Baldissero. Mountain bike. There is no embarrassment to the choice, facilitated by a newly-created card that can be requested at valley info points. Last but not least, it is advisable to schedule at least a couple of days, combining walking on the marked trails or visiting mineralogical areas: Valchiusella is the most varied mineral area in Italy. SFM Line (Servizio Ferroviario Metropolitano) with station in Castellamonte, 6 km from Ponte Preti (formerly Canavesana Railroad). ... indeed, in spite of appearance, they boast a varied and, above all, exclusive flora. They are also known as "Monti Rossi" ("Red Mountains"), chromium thanks to which they stand out in the green canvas landscape, on the plain between Castellamonte and Ivrea, at the outlet of Valchiusella. But not just the color it is. The area of the Pelati Mountains is in fact a true bio-geographic island, characterized by very different ecosystems from neighboring areas. This is a completely unique situation, endorsed by the establishment of a protected area in 1993: the Natural Reserve of the Monti Pelati (Peeled Mountains) and Torre Cives (the tower, which stands out on the top of the hill at 581 m). The prerogatives of the area are essentially geological: the whole reserve lies along the Insubrica Line (or Canavese Line), which separates two tectonic plates. The Pelati Mountains are a massive ofiolithic form almost entirely of fresh lherzolite, gray-green (the rock composition is the reason for the past magnesium extraction activity).Particular is also the microclimate, with a strong xeric component, which favors, among other things, the presence of rare species of insects. Peda luteella, Phytoecia vulneris, Leptothorax flavicornis, names that say nothing to the most but stimulate ... the anthems of entomologists. But above all, the avifauna is to exploit the peculiarities of the reserve: totty, ortolane, trench coats, various fringillids such as the tapestry and the lizard. 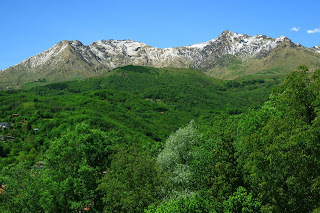 The peculiarities are the tufted ponytail, usually tied to coniferous mountain forests, and the migratory silviper, which in the Alps nestles only over 1000 m. On the contrary, the calander and the occhiocotto are typical of the Mediterranean climate.The climate and the rocky substrate are at the origin of an interesting lichenic flora and ruins. Restricted is the high-pitched vegetation, almost exclusively on the north side and characterized by birches, black pines, silvestri and strobi (aloft species), implanted in the 1950s. Same source for larch reforestation, located on the north side of Monte Cives.Monti Pelati apart, interesting from the geological point of view is a bit the whole area of ​​the Chiusella creek at the outskirts in the plain. 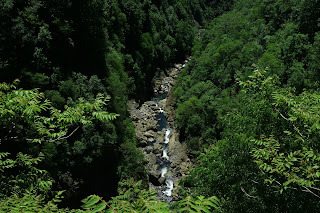 The spectacular Gurzia Gorge is the result of a change of Chiusella trail after the glacier retreat covering Ivrea plain (about 20,000 years ago). A park so far not done and it's really a shame. In addition to protecting the area, the establishment of a protected area would be an important environmental quality mark for the whole valley. The area is located in a basin inside the right side of Ivrea's morenic amphitheater, originated by the retreat of the great Balteo glacier. An area of high natural value, appropriately identified as a Community Interest Point (SIC) under the European Habitat Directive. SIC's naturalistic excellence is the area of ​​the two lakes of Alice, Great and Small, with adjacent peatlands. This is indeed the sector that hosts the most interesting environments and species. Plant species such as fibrin clover (Menyanthes trifoliata), bunch of cherries (Prunus padus) and aldicides of black alder that surround the wetlands. Among the animal species, the crushed tritone (Triturus Carnifex) and the raganella (Hyla intermedia) are reported. At the far north, the SIC includes the lakes of Meugliano, an area of ​​considerable tourist inflow, also induced by the impressive coniferous wood surrounding the water's mirror, a beautiful planting forest, but forced and abnormally environmentally friendly. Always in the north, the SIC expands to a bottom of the valley to understand the gorge of Garavot, where the Chiusella torrent is forced into a narrow ravine between large polished rocks, resulting in a spectacular succession of swimming pools and jumps.